Does your station truly have a well-planned Promotion Attack...or do you often find yourself playing catch-up with the calendar, feverishly trying to throw together a promotion at the last-minute? Doug Harris has earned an international reputation for merging creative passion with planning...and he'll share the secrets of both with you! 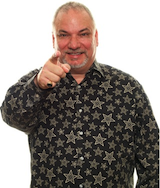 Keeping everyone in the station "in the loop"
Click the button below to add the PLANNING YOUR 12–MONTH PROMOTIONS ATTACK by Doug Harris (2-CD Set) to your wish list.